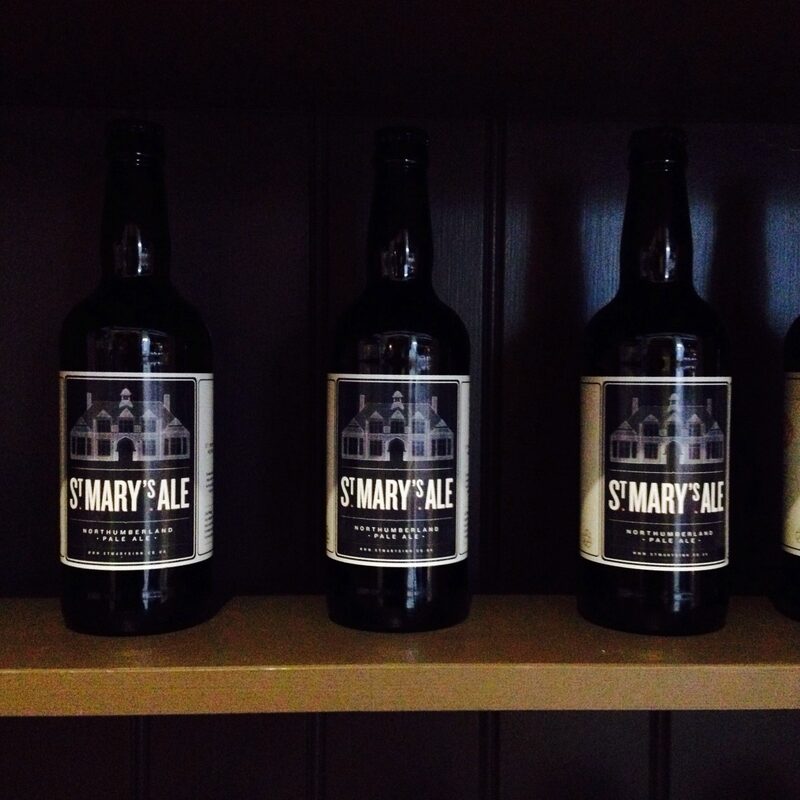 We thought we’d check out St Mary’s Inn to see if it was possible that the former administration building of the imposing St Mary’s Psychiatric Hospital could be the new foodie haven it’s cracked up to be. From the people who brought us Jesmond Dene House, St Mary’s stands in shadow of the hospital which has been derelict for 20 years. Upon entering the ‘pub with rooms’ (as they refer to it) we were pleased to see that it had been thoughtfully restored; retaining oak beams, fireplaces and exposed brickwork. 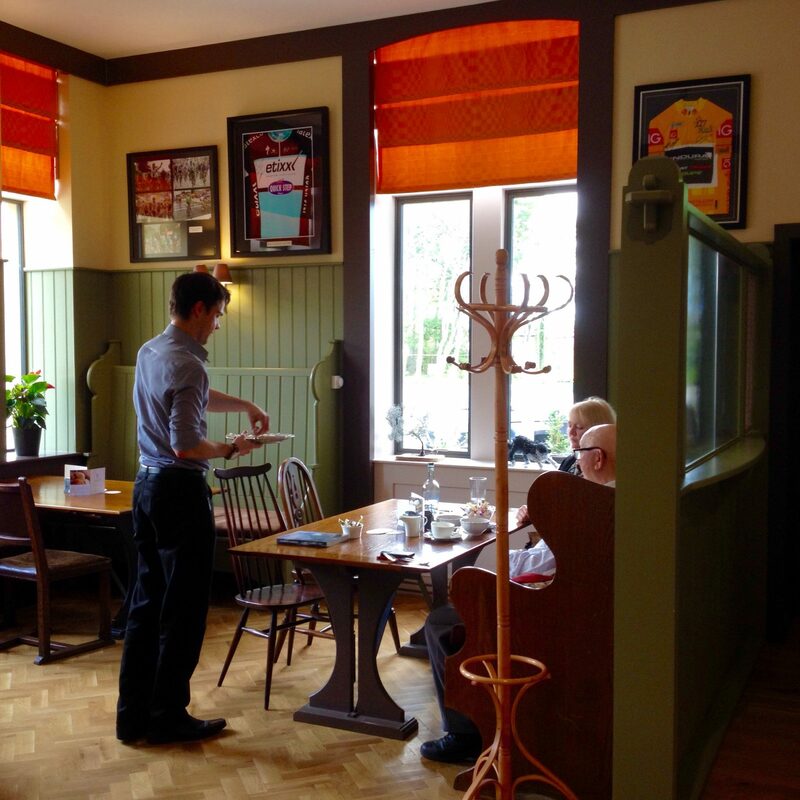 Split into a series of interlinking rooms, there are dining options a-plenty. 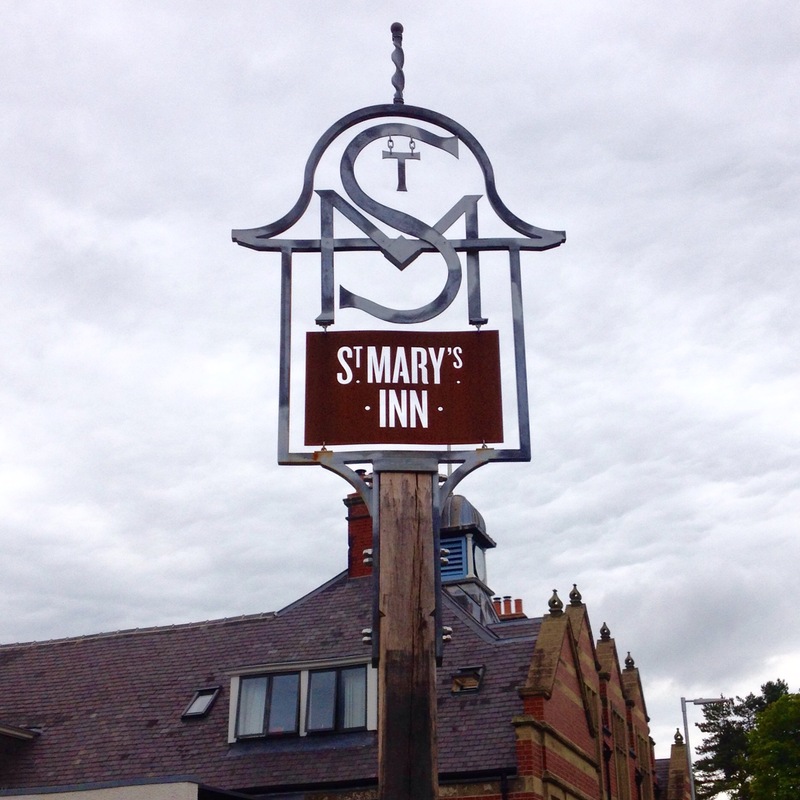 Clearly keen to welcome the locals, the pub hosts regular meet ups for cycling enthusiasts, live music, pie & pint nights, and sells its homemade sourdough and St Mary’s Ale, brewed by Wylam Brewery just down the road. These guys embrace local art too, with an impressive collection of paintings depicting old Northumbrian pub culture adorning the walls. We came for late lunch on a Friday and chose one of the snug rooms which we had to ourselves, probably best for the other diners as Little Dude was in a bit of a noisy mood! Having taken LD swimming that morning (which involves a lot of effort on my part!) I was starving and so was the Mr (he doesn’t need an excuse!) so we were ready for some hearty, home cooked fayre. 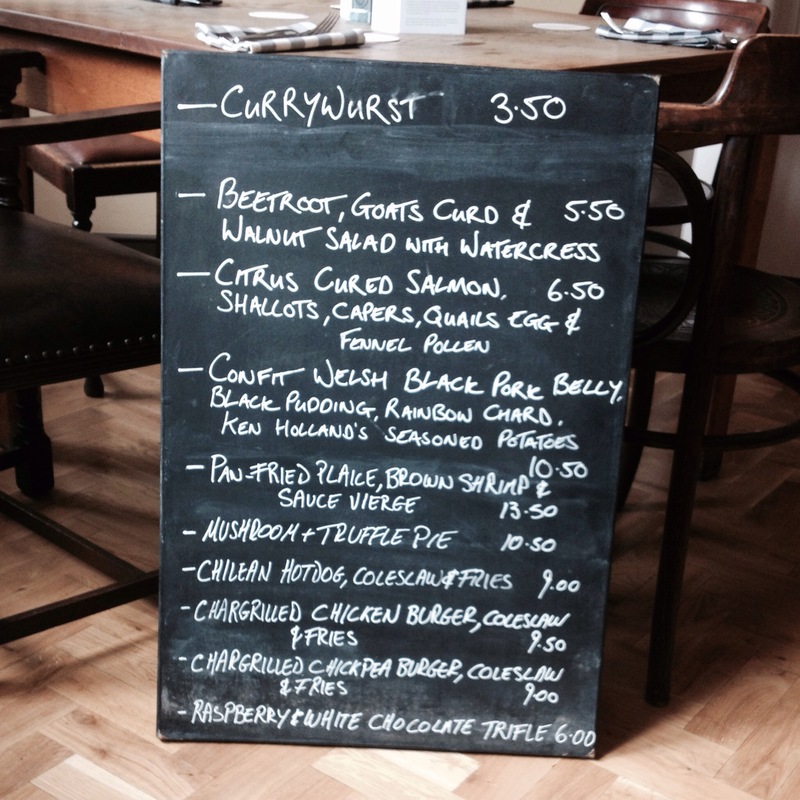 The specials were brought over on a chalkboard and I was immediately tempted by a seasonal beetroot, goats curd and walnut salad (£5.50) while the Mr went for local mackerel, heirloom tomatoes and basil on toast (£6) from the unpretentious main menu full of home comforts. 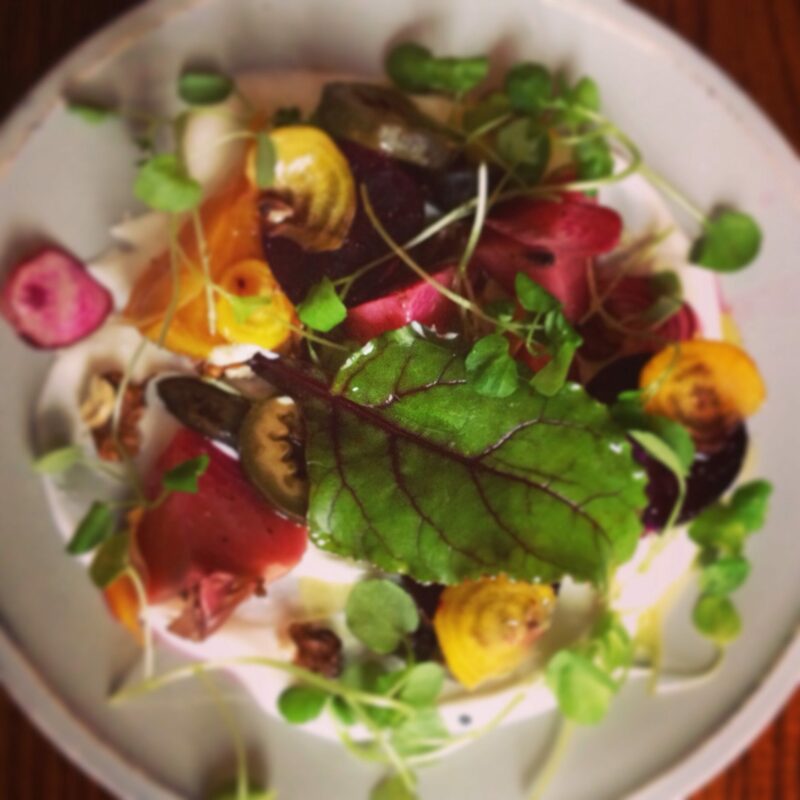 The salad arrived after a short wait and gave me a real taste of summer; a rainbow of seasonal beetroot which was perfectly complimented by the goats curd, watercress and fresh & pickled walnut medley. 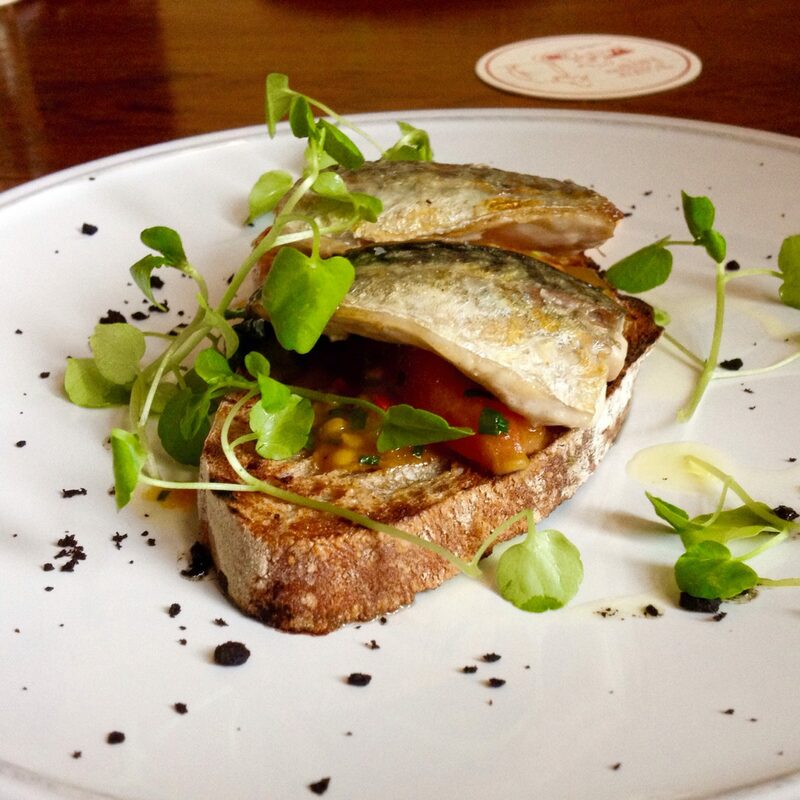 The Mr’s mackerel was served on piece of toasted sourdough with roasted tomatoes, watercress and basil. He found the mackerel cooked to perfection – succulent and tender and the tomatoes added flavour and moisture to the dish. 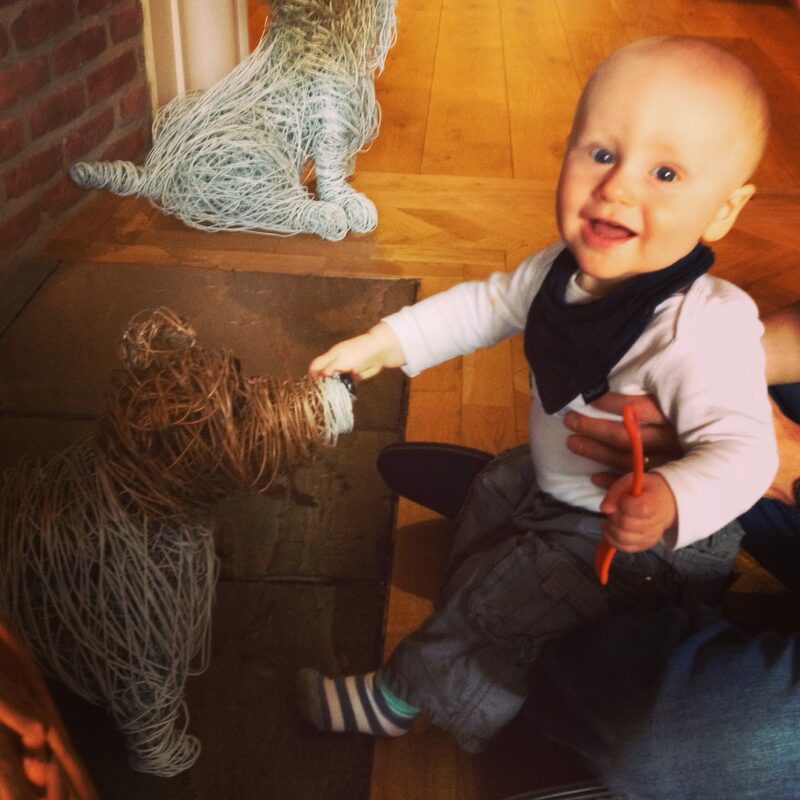 LD was instantly enamoured with the wire sculpture of a westie next to the fireplace. He chuckled away, his mood quickly elevated. This place is great for kids – lots of room and no snooty looks if they want to run around and explore. 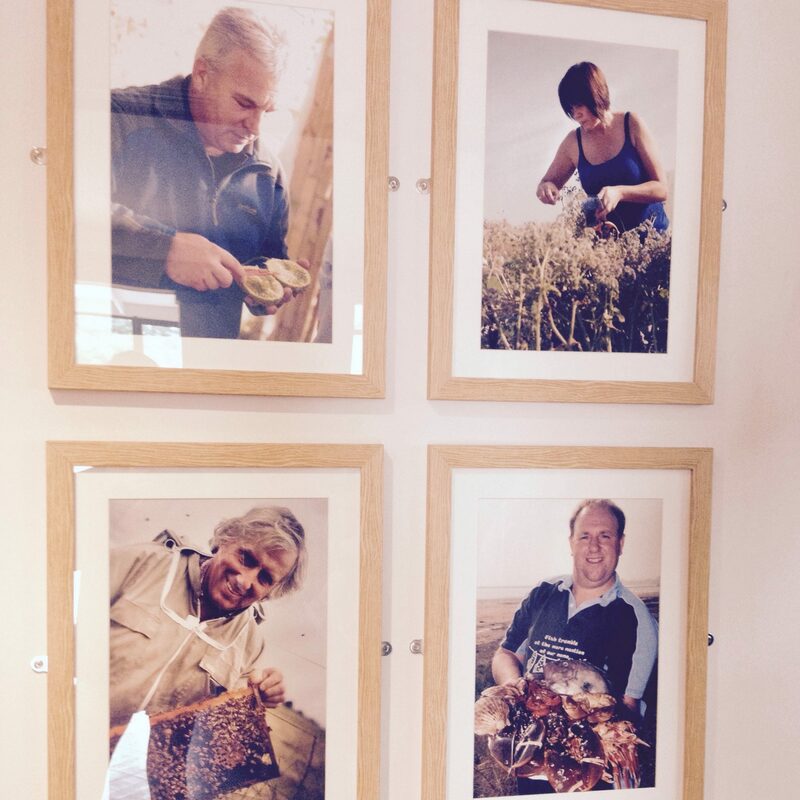 I had a look around, and loved little touches like the photos of local suppliers and the pictures of suffragette Emily Davison, who was buried in Morpeth. Looking at the spooky ruins of St Mary’s hospital through the windows at what used to be know as the ‘Gateshead Lunatic Asylum.’ Plans are underway to demolish and build houses on the land. Let’s hope there are no spooky residents lurking! Heading back to our table, I was happy that our mains were promptly served. 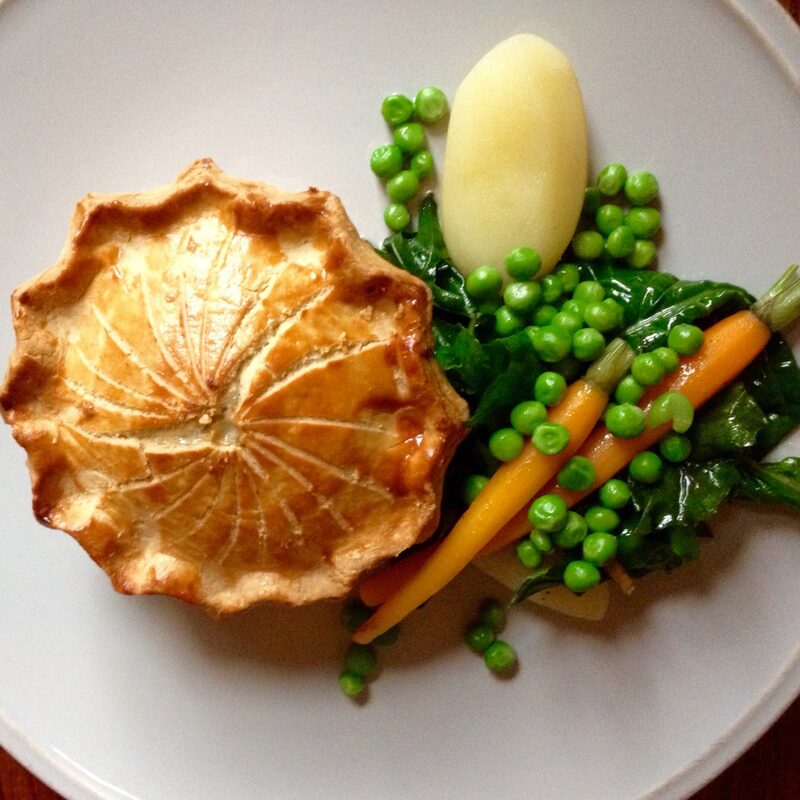 I had plumped for another vegetarian dish, again from the specials board – mushroom and truffle pie with potatoes and seasonal veg (£10.50). It was almost a pity to cut into the artfully decorated crust, which held a bounty of wild mushrooms in a delicious creamy sauce. The truffle (oil? shavings?) was hard to detect but there was a nice salty earthiness which I’m guessing it had a hand in. The veg was cooked simply and locally sourced (big thumbs up), not masses of it but more than enough for me, given how filling the pie was. 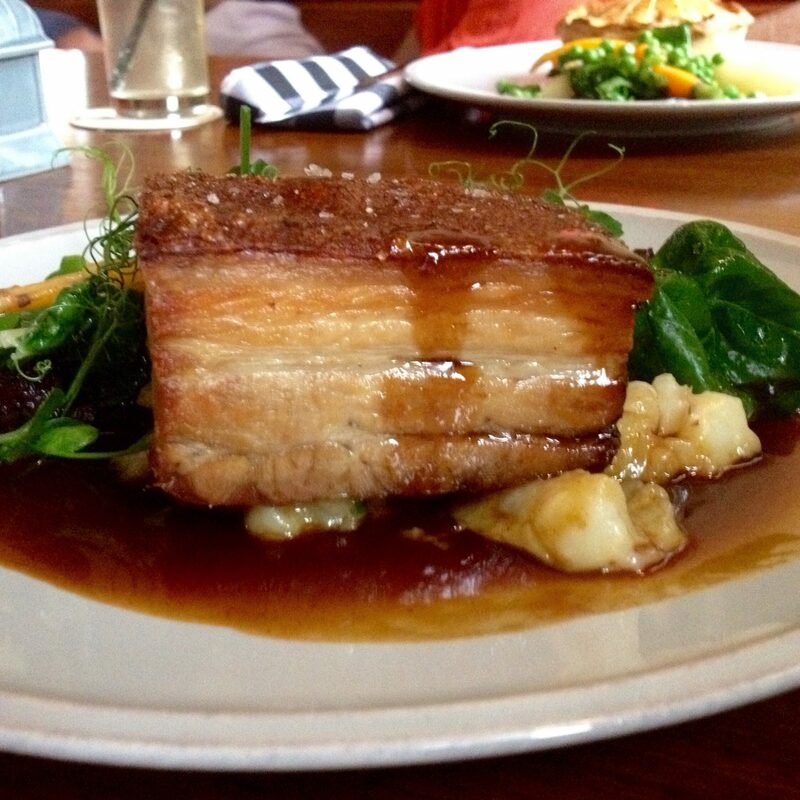 The Mr had selected confit Welsh black pork belly, black pudding, rainbow chard and Ken Holland’s seasoned potatoes (£10.50). He let me have a bite and before I’d even begun to chew I was in heaven – major food envy! Crispy crackling gave way to tender meat, and even the fat was delicious. The black pudding was chopped up and dotted around the plate with the jus, which the Mr liked and preferred to the usual big slice of black pudding as it led to ‘even distribution’ and didn’t overpower the pork. He found the gravy a little salty and a steak knife might’ve been useful for cutting through that crackling crust! Otherwise a perfect dish. He was stuffed and couldn’t manage a desert, but I could! 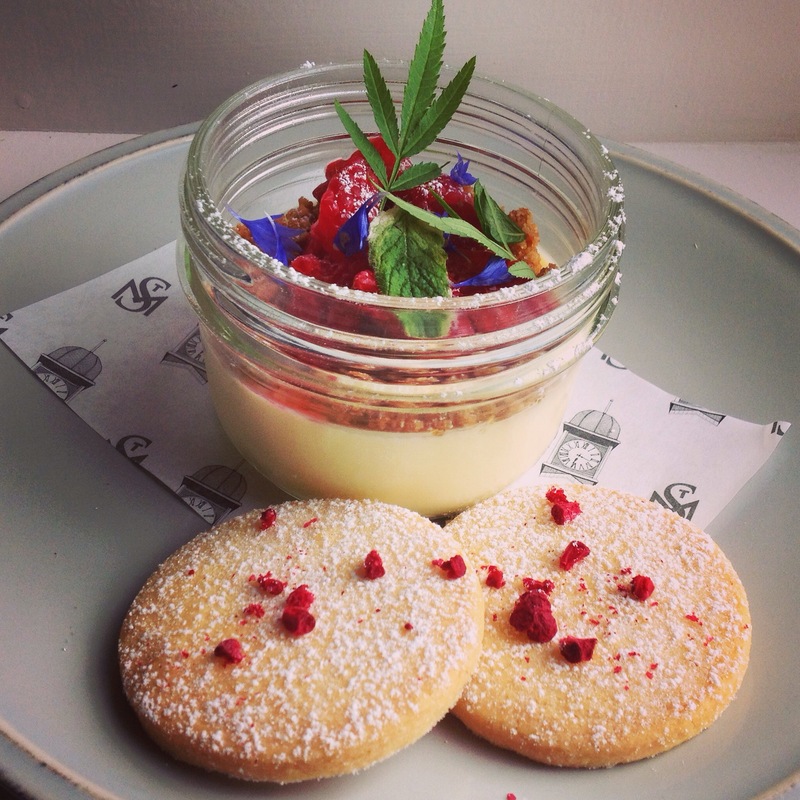 Lemon posset with salted crumble and homemade shortbread (£6) sounded delicious. I loved the presentation of my pudding, from the edible flowers and mint leaves down to the monogrammed paper. I’m no posset connoisseur but this was lemony, creamy nirvana and I enjoyed dunking the shortbread in once I’d polished off the crumble topping. One for those with a sweet tooth (like me), for sure!